The following is a journey into identifying speaking in tongues through Hebrew and Greek Jewish traditions. This is an introduction to a series of articles devoted to this subject. Researching Jewish traditions about speakers and interpreters has uncovered two very important customs that are so close to Paul’s narrative that it would be hard to call them accidental parallels. The first solution relates to the reading out loud of Scripture in Hebrew with an immediate translation in the local vernacular. The second one is the custom of instructing in Hebrew and providing a translation into the local language. There is also a third alternative: the use of Aramaic as the language of worship and education in conflict with the Greek Corinth assembly constituents. This could be a solution if more information comes forward. For the time being it will be relegated a distant third option and only small snippets of this subject will be addressed. The majority of this series will be devoted to the first two concepts. These first two options have existed all along but few have paid attention to them in the Christian community. This Jewish-centric approach has been minimized for two reasons: antisemitism and ignorance of Jewish literature in both Catholic and Protestant communities, and the hyper-emphasis on the Greek and Latin cultures to exclusivity by rationalist scholars in the 1800s. The option of instructing in Hebrew with a translation into the local language best fits the Corinthian narrative. 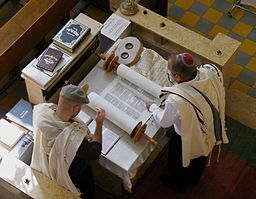 However, the rite of public reading in Hebrew with an immediate translation into the local language does have some strengths that cannot be discounted. The solution could even be a mixture of the two. A seven point historic portrait on the christian doctrine of speaking in tongues. The conclusions have been derived from the Gift of Tongues Project. A research work that has a fourfold aim of locating, digitizing, translating source texts and tracing perceptions from inception to modern times. These seven points may change if any new documents arise with important new clues. How the doctrine of cessationism percolated within certain Church of England splinter groups and especially those that immigrated to America. This is part 4 of the series of Cessationism, Miracles, and Tongues. Part 1 was an introduction with a general summary. Part 2 uncovered the medieval psyche surrounding the supernatural, miracles, and magic. This same article also contained how the protestant movement revised the perceptions of miracles in the early church from the traditional catholic opinion. Part 3 demonstrated how the Church of England, especially through the influence of the Puritans, officially formulated the doctrine of cessationism. The most populous splinter group from the Church of England was the Methodist movement. This is where the analysis starts for Part 4. The Protestant view of miracles from Martin Luther to the Church of England. This is part 3 of a series surveying the doctrine of cessationism. Part 1 was an introduction and a general summary. Part 2 gave a background to the medieval mindset that was highly dependent on the supernatural, magic and mystery in daily living. It also covered the re-examination of earlier christian history by prominent English leaders to demonstrate that miracles had ceased. This series has a tertiary focus on the role of speaking in tongues within the cessationist doctrine. Those who adhere to a strong adherence to cessationism categorize tongues as a miracle, and since all miracles have ceased, the christian rite of tongues is no longer available. Any current practice is considered a false one. This forces this series to shift away from the christian doctrine of tongues, and move into the protestant doctrine of miracles. This article will demonstrate the Puritans were largely responsible for shaping the doctrine of cessationism through various means, especially the Westminster Confession. This doctrine may be the English Church’s most recognizable contribution to the protestant revolution throughout the world. This is part 2 of the series on cessationism, miracles, and tongues. The focus here is on why miracles were de-emphasized during the Reformation. Secondly, an analysis on the Protestant revision of miracles in the early church. Cessationism and the critical examination of miracles cannot be fully understood without first understanding the medieval environment they were birthed from. The following gives a brief portrait of the mystical medieval world and why there was an urgent need for correcting the abuse of miracles. Introduction to a four-part series on cessationism, the de-emphasis of miracles, and especially how it relates to speaking in tongues. The Church of England and Miracles. Cessationism from the 1800s and onwards: the Baptists, Presbyterians, B. B. Warfield, Christian higher education, John MacArthur, and more. An infographic on the doctrine of cessationism. How it fits into the larger debate on miracles, and its consequent effect on the doctrine of tongues. The book A History of the Rise and Influence of Rationalism in Europe (2 vols., 1865) is a seminal piece of literature. 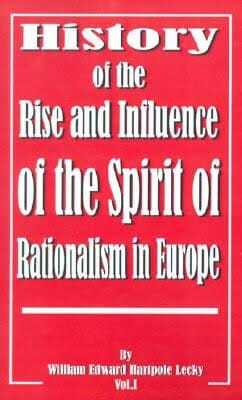 This well written work helps to provide valuable insights for the modern reader with the backstory on the conversion of Europe from a mystical to a rational society. This book was written by William Lecky, an Irish-Anglican historian and politician (1838–1903). He greatly succeeded in studying and narrating the complex and evolving web of rationalism, morals, miracles, the supernatural, Catholicism, and Protestantism into a systematic and comprehensive portrait. 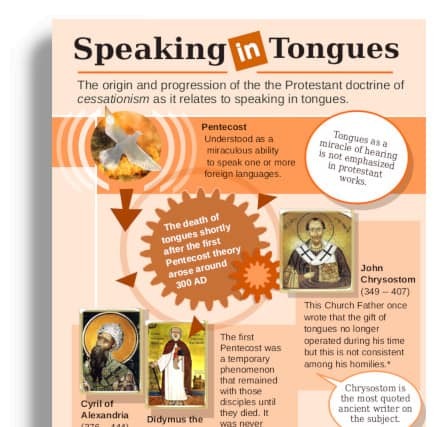 The following infographic was created to describe why other tongues, otherwise known as strange tongues or unknown tongues was added to I Corinthians. The results may surprise many observers — this idiom was an English Bible translation phenomenon that started in the 1500s.